US demand for biocompatible materials is forecast to increase 4.9 percent annually to $5.6 billion in 2018. Ceramic materials will grow the fastest based on improved nanotechnology compounds for orthopedic implants, spinal fixation devices and dental products. Natural polymers will be the second fastest growing segment, paced by hyaluronic acid. 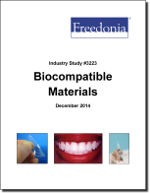 This study analyzes the $4.4 billion US biocompatible materials industry. It presents historical demand data (2003, 2008 and 2013) and forecasts (2018 and 2023) by product (e.g., synthetic polymers, natural polymers, ceramics, metals) and application (e.g., surgical and medical instruments, surgical appliances and supplies, dental products and materials, drug delivery products, electromedical equipment, diagnostic products, ophthalmic goods). The study also considers market environment factors, details industry structure, evaluates company market share and profiles 31 industry players, including Dow Chemical, BASF and PolyOne.